The costs of sexual and domestic violence are astronomical. 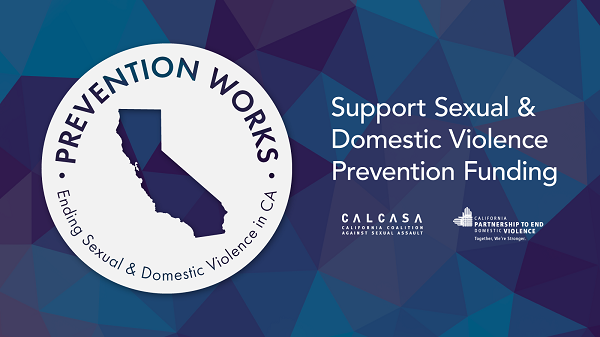 Sexual violence costs the state of California $140 billion, and the lifetime economic burden of domestic violence nation-wide is $3.6 trillion. The trauma and lost opportunities are immeasurable. It’s time for a new vision of California—one that prioritizes prevention to address root causes of violence. 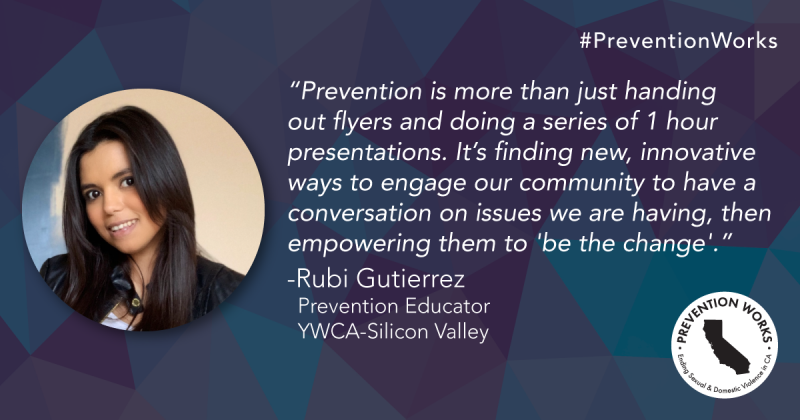 #PreventionWorks by teaching safe and healthy relationship skills much earlier in life, improving school climate and safety, engaging boys and men in gender equity, and promoting racial justice with culturally-responsive solutions. We believe, and the research demonstrates, that these strategies can help our state prevail over sexual and domestic violence. To achieve this vision, California needs to make a strategic investment of $50 Million in ongoing funding for prevention strategies. Coming up: We need people power at the Capitol! Join us Wednesday, April 24th at 10 a.m. for our Denim Day + Policy Advocacy Day Rally. RSVP today. Organizations, add your name to our support letter! New state funding can create the social change we need to turn the tide on sexual and domestic violence! Call your local Assemblymember & Senator and encourage them to support our budget request. Order free postcards to send to your policymakers. Our policy advocacy relies on your support. Make a donation today! Use our shareable social media images and sample posts to build support for our campaign! 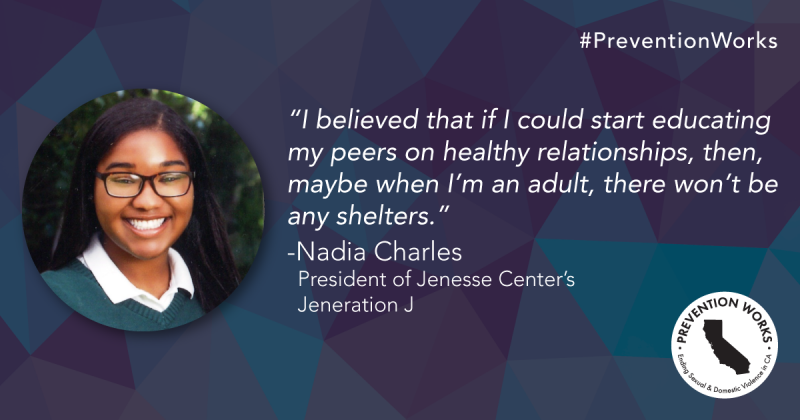 I started volunteering at Jenesse Center six years ago, at the M. Sue Frazier Summer Camp, Jenesse’s signature summer program for the children that reside in their shelter program. I had the fortune of working with children of all ages. I immediately noticed that all of the children were innocent in this process and were just trying to navigate their normal. At a previous non-profit, I worked in a case management program that focused on youth ages 18-19. 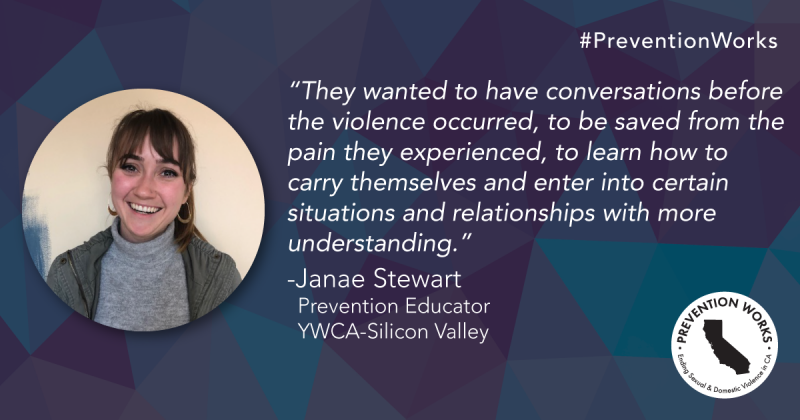 All of the options we had to offer were post-care and intervention focused, meaning it was all after they faced abuse or violence in their relationships. I will always remember them saying that prevention was what they wish they had. 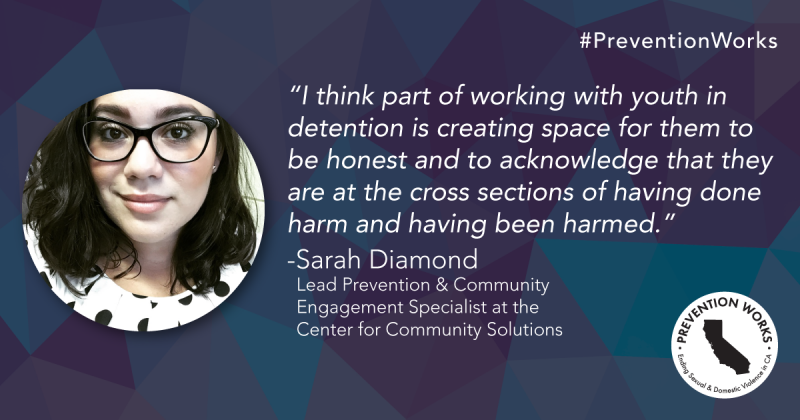 I began prevention work at Fresno’s Juvenile Justice Campus as a counseling volunteer, where we helped incarcerated youth finish high school through tutoring and mentoring and find jobs. It was there that I was trained on facilitating a curriculum called Safe Dates—and found my passion for prevention. During my interview to work at the Center for Community Solutions (CCS), my to-be-supervisor shared that they worked with youth in detention and asked if that was something I’d be interested in doing if I was hired on. At first, it felt somewhat daunting to think that I’d be going into a juvenile hall. I don’t think I held negative views of youth in detention, but I also was unsure of what to expect from them. It ultimately sold me on the position.